In the late summer of 1992, after taking part in the Crested Butte Chamber Music Festival (Colorado) Peter Sanders returned to Vermont and his family's summer home in the Randolph area. At that time, Chandler Music Hall was not getting the performance use it deserved as one of Vermont's premiere concert venues. After some discussion with his mother (who had the festival idea,) he was guided to speak with Laura Morris, at Chandler. Following some back and forth negotiations and under the umbrella of the A. B. Chandler Cultural Foundation, the Central Vermont Chamber Music Festival was created and season number one was presented in 1993. August 1993 was a highly successful and critically acclaimed first season. The CVCMF applied for its own not-for-profit 501(c)(3) status in early 1994 which was granted. Originally very much a family run festival, the CVCMF has grown over the years. The Randolph area community has been very supportive and now assists with the production of an interesting variety of concerts including world-class chamber performances, an annual children's concert, a variety of radio performances and two open rehearsals. Spring concerts have become a tradition at the Three Stallion Inn in Randolph with presentations by string ensembles to consistently sold-out houses. 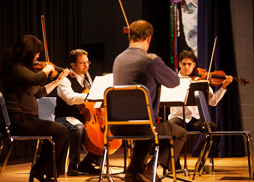 Festival musicians also give a special annual concert at the local high school which is always enjoyed by students, faculty and performers alike. In the summer of 2005 the CVCMF released its first highlight CD "Festival Harvest", which includes recordings from the 2000 and 2004 seasons. Wonderful performances of the Mendelssohn String Quintet in A Major, Op. 18, Schönberg - Verklarte Nacht, Op. 4 and the Frank Bridge Phantasie Trio (Trio No.1) in c minor are included. The CD was given a rave review by Jim Lowe the Times Argus newspaper critic. This disc is a fine example of the World-class Music in the Heart of Vermont that the festival offers. The Central Vermont Chamber Music Festival has earned its reputation over the years as a major contributor to the summer music scene in Vermont and the Northeast. Be sure to encourage people to visit this website: www.centralvtchambermusicfest.org, and you are most welcome to join us as a Facebook friend! RANDOLPH - Last weekend, two of Vermont's most important chamber music festivals ended their seasons with programs that couldn't have been more different. Yet the two have the important things - particularly values - in common. Randolph's Central Vermont Chamber Music Festival closed its 26th season Aug. 25 at Chandler Music Hall with a very traditional program of Beethoven, Dvorak and stretching it a bit with Gideon Klein (1919-1945). But its brilliant and rich performance of Dvorak's Piano Quartet No. 2 in E-flat Major, Op. 87, is the reason most people go to chamber music concerts. Conversely, Lake Champlain Chamber Music Festival celebrated its 10th year with a co-premiere (a co-commission with three other festivals) of a brilliant work by resident composer David Ludwig at the Elley-Long Center in Colchester. "Paganiniana," named for the work of the same name by legendary violinist Nathan Milstein, is a dramatic concerto for solo violin and chamber ensemble (piano, flute, clarinet, violin, cello and percussion). The roughly 18-minute work is based on a survey of Niccolà Paganini's (1782-1840) ferociously virtuosic 24 Caprices, Op. 1 for solo violin, which aptly describes the solo part in Ludwig's mini-concerto. Festival founder and co-artistic director Soovin Kim was the able soloist, delivering the Paganini paraphrases and "modernizations" with panache. Punctuating was the klezmer-flavored ensemble that added the varying and sometimes jazz-flavored theatrical element, contrasting Kim's turns of virtuosity and more ethereal solos. Although some of the solo parts seemed a bit long, the concerto proved a crowd pleaser - with real substance. Delmoni was joined by fellow NYC Ballet musicians, violist Katarzyna Breila-Weiss and cellist Peter Sanders, festival founder and director, and New York pianist Adrienne Kim. The performance was expert and rewarding, particularly the heart-wrenching cello solos in the Lento, played by Sanders in memory of his father, a Columbia University music professor who died earlier this year at 99. The same performance qualities applied to the remainder of the program, Beethoven's "Kakadu" Variations, Op. 121A for piano trio and Klein's spicy 1944 String Trio. The Lake Champlain concert opened with the original "Paganinia Variations," a fantasy-medley in which Milstein makes Paganini Caprices and Concerto No. 1 even more difficult. Violinist Bella Hristova, Ludwig's wife, performed with a beautiful virtuosity, refined with finesse, yet exciting. Paganini remained the theme as pianists Gloria Chien, festival co-artistic director with her husband Kim, and renowned Canadian pianist Marc-André Hamelin performed with flair Witold Lutoslawski's 1941 Variations on a Theme by Paganini (the ubiquitous Caprice No. 24). They both also joined in the festival's substantial finale, a spirited, colorful and virtuosic performance of the two-piano version of Igor Stravinsky's 1913 "Rite of Spring." Other than programming, the other big difference is size and scope. Central Vermont serves a small community, tiny Randolph and environs, yet it offers education opportunities, open rehearsals, work with and for kids. It has become a rite of summer for the Randolph area. Set in Vermont's most populous county, Lake Champlain draws on Burlington for its often sold out performances and cadre of supporters. The festival offers pass holders a weeklong immersion in its music with open rehearsals, master classes, discussions and much, much more. It is also the only festival I have attended in which most of the audience shows up for the pre-concert lecture. Amazing! Both the Central Vermont Chamber Music Festival and Lake Champlain Chamber Music Festival have become integral parts of the Vermont music experience. Aren't we lucky? 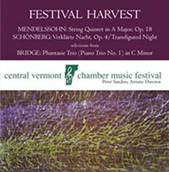 RANDOLPH - Celebrating 25 years Saturday at the Chandler Music Hall, the Central Vermont Chamber Music Festival returned to where it began with a delightful performance of Schubert's "Trout" Quintet. A quarter of a century ago, New York City Ballet cellist Peter Sanders began bringing his musician friends to Vermont at the end of each summer to do something they seldom had the time for in the city; play chamber music together. Sanders was already part of the community - his family summered here, beginning in his youth - and it wasn't long before his Central Vermont Chamber Music Festival was an integral part of Randolph culture. Saturday's performance of Franz Schubert's Piano Quintet in A Major, D. 667, is called "Trout" for the Schubert song from where it gets its theme. In fact, the work's irrepressible lyricism reflects Schubert's greatness as a songwriter, and is largely responsible for making this one of the most popular works of chamber music of all time. Something of a piano concerto, the performance benefited from lyrical playing and the beautifully articulated expressiveness of pianist Adrienne Kim, a newcomer to the festival who also teaches at Weston's Kinhaven Music School. Although she missed some of the percussive possibilities that can punctuate the work, Kim was the anchor of the performance. Violinist Basia Danilow, Sanders' wife and a longtime member of the festival, played with a singing lyricism. Arturo Delmoni, New York City Ballet concertmaster and another longtime regular, was heard Saturday on viola - and most expressively - as was Sanders on cello. David Mercier, a sophomore at Bard College, was the "swinging" percussion section on bass. Another delight from the first season was Bohuslav Martinu's Three Madrigals for violin and viola. Danilow and Delmoni delivered the joy of this quirky 20th century work with spirit and lyricism. The middle one, Poco andante; andante moderato, was a uniquely beautiful mix of haunting expressiveness and passion. Sanders and Kim opened the program with Robert Schumann's Fantasy Pieces, Op. 73. Sanders' warm lyricism was both matched and punctuated by Kim's sensitive and rhapsodic playing. In a tribute to his 98-year-old father, missing the festival for the first time, Sanders and Kim played Maurice Ravel's "Pièce en forme de Habanera," a delightful quirky work performed charmingly. The Central Chamber Music Festival has earned its place as one of Vermont's finest music festivals. And that's saying something. RANDOLPH - Any doubt as to why Beethoven's "Archduke" Trio and Brahms' G Minor Piano Quartet are considered "war horses" were washed away with the substantial performances, Saturday at the Chandler Music Hall, opening the 24th Central Vermont Chamber Music Festival. (The program was repeated Sunday in Woodstock.) These works are called "war horses" not only for their familiarity to chamber music lovers, but their position as great masterpieces of the repertoire. 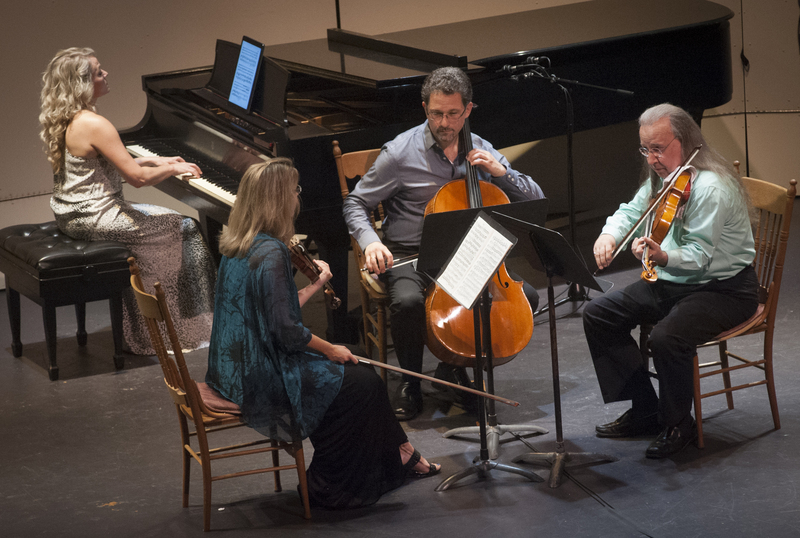 Cellist, founder and artistic director Peter Sanders, his violinist wife Basia Danilow of the Lark Quartet, and virtuoso violinist-violist Arturo Delmoni, all festival regulars, were joined by newcomer New York City pianist Molly Morkoski in the performance. Johannes Brahms' Piano Quartet No. 1 in g minor, Opus 26, is a big sprawling work, full of Romantic grandeur. Violinist Danilow played with musical intensity balanced with a warm lyricism, always with rhythmic incisiveness. Violist Delmoni and cellist Sanders both played with an overt and deep expressiveness. Although pianist Morkoski missed some of the work's sense of immediacy, her virtuosity complemented and punctuated the rich string sound and lyricism. The slow movement, Andante con moto, was deeply affecting, while the driving finale Rondo all Zingarese, was a thrill. 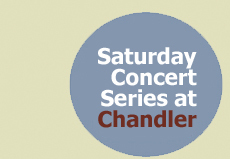 perform Brahms Saturday at Chandler Music Hall. Delmoni, the senior artist, played with a luscious sound and expressiveness, just the right amount of restraint, and a profound musical depth. Sanders and Danilow performed with a more focused, restrained sound, but natural expressiveness. Morkoski, with focus on the right hand over the bass of the left, was all about lyricism, the flowing line. Ludwig van Beethoven's Piano Trio in B-flat Major, Op. 47, "Archduke," is a grand work, and unusually elegant for the composer. Delmoni and cellist Sanders, in his first performance of the work, were responsible for some luscious and expressive playing, but pianist Morkoski's lyricism overlooked the work's rhythmic form, sapping its grandeur. Beethoven was still in the Classical period when the music was dependent on a rhythmic square-ness and consistency for its power; while breathing within the structure added expressiveness, overlooking the rhythmic lines cut into its musical power. Still, Saturday's performance was a joy of sound and lyricism. The festival's Saturday, Aug. 27, concert includes only one "war horse," Dvorak's "American" String Quartet, but likely will introduce listeners to two intriguing works: Richard Strauss's String Quartet and "Lullaby" for string quartet by George Gershwin. Should be a real pleasure. RANDOLPH - The Central Vermont Chamber Music Festival closed its 23rd season at Chandler Music Hall Saturday with a program of particular substance. Two chamber music masterpieces by great masters were performed masterfully. Johannes Brahms' String Quintet No. 2 in G Major, Opus 111, was the big success of the program. Led by violinist Arturo Delmoni, violinists Basia Danilow, Kathryn Lockwood and David Cerutti, and cellist Peter Sanders (the festival's founder and artistic director) played beautifully - meaning not just well, but with beautiful sound and expression. Most importantly, these fine players gave the work full Romantic dimension without "romanticizing" it. Although Brahms was a certainly a Romantic composer, stretching the lines to be expressive, unlike in Schumann, kills his music's power. These players were passionate throughout - but reserved enough to deliver that power. The five veteran musicians achieved a glorious sound, particularly rich in the slow movement, Adagio. The opening Allegro non troppo con brio had plenty of just that - brio. The scherzo was lyrical, while the finale's drive was quite exciting. This was playing as fine as one can find anywhere among Vermont's summer music festivals. The program's opener, Wolfgang Amadeus Mozart's String Quintet No. 3 in C Major, K. 515, sounded glorious, but took a bit to take off. The personnel shifted a bit: Delmoni remained on first violin, but was joined by Adela Pe–a on second; Cerutti moved to first viola, with Lockwood on second; and Sanders was still cellist. The opening two movements, Allegro and a menuet and trio, were elegant and beautiful sounding, but a little too restrained to deliver the music's sparkle and depth. However, with the Andante, the spirit took off - without ever violating the work's Classical strictures. The expressiveness intensified and the Andante's lyricism became joyful. And the final Allegro had the drive to keep it exciting, never losing Mozart's elegance. This music demands plenty of virtuosity that is seldom showy - except, perhaps the first violin - and these folks delivered. With 23 years under its belt, the Central Vermont Chamber Music Festival is able to deliver truly satisfying performances of these masterpieces - only possible from mature players. RANDOLPH - Saturday's Central Vermont Chamber Music Festival opening concert was about as good as one is likely to hear in Vermont - which means anywhere in the world. Celebrating its 22nd year at Chandler Music Hall, the two-week New York-based chamber music festival opened with three masterpieces, expertly and beautifully played. The major work was Czech composer Bedrich Smetana's Piano Trio in g minor, Opus 15. The Bohemian-flavored 1855 work rambles beautifully, mixing passion with pathos, in the mid-Romantic tradition. Pianist Jung Lin, violinist Arturo Delmoni and cellist Peter Sanders, the festival's founder and artistic director, delivered an expert, virtuosic and passionate performance - with plenty of tenderness as well. The Taiwan-born Juilliard-trained Lin played with an attractive mix of power and clarity, delivering the quietly lyrical passages poetically. Delmoni, one of New York's finest virtuoso violinists, played deftly with a warm lyricism, while Sanders matched the violinist all the way. The three played with great sensitivity, expressing the rich passion of the work as well as its deep lyricism. Sanders and Lin were featured in Sergei Rachmaninoff's monumental Sonata in g minor, Opus 19, for cello and piano. Sanders played with warmth, passion and virtuosity, complemented by Lin's rhapsodic performance, again mixing clarity and power. Although there were a few moments of lost momentum in the final Presto, the slow movement, Andante, was sheer poetry. Delmoni, accompanied by Lin, opened the program with a great favorite of the virtuoso violin literature. Giuseppe Tartini's "Devil's Trill" Sonata (in g minor for violin and continuo) is a brilliant Baroque showpiece. Delmoni played with a warmth and lyricism seldom heard these days, and his virtuosic passages were crisp and deft. It was a deeply satisfying, exciting performance. Vermont has some of the best chamber music concerts heard anywhere in the world, and the Central Vermont Chamber Music Festival produces some of the best in the state. And this was one. RANDOLPH - The Central Vermont Chamber Music Festival opened its 21st summer season Saturday at the Chandler Music Hall with an unusual program that proved most satisfying. Remaining concerts are in Randolph and Montpelier through next weekend. The major work Saturday, though, was a staple of the chamber music repertoire. Johannes Brahms' 1865 "Horn Trio," the Trio in E-flat Major, Opus 40, is a grand and lyrical work, full of beauty, passion and deep emotion. Pianist Jung Lin, violinist Basia Danilow and French hornist Ellen Dinwiddie Smith proved more than able in a moving and exciting performance. Lin, new to the festival, played with clarity, sensitivity and, when called for, power. Danilow, a staple of the festival, was warm and passionate, but always within Brahms' limits. Smith, another newcomer, played with warmth and lyricism. The slow movement, Adagio mesto, proved particularly affecting, full of pathos and introspective emotional power. Although there were some rough edges, the final Allegro con brio drove to an exciting end. Delightful is the best way to describe Dmitri Shostakovich's Five Pieces for Two Violins and Piano (arranged by Lev Atovmian from other works with the composer's sanction). Rather than Shostakovich's usual brooding darkness and sardonic wit, these pieces, though never insipid, are filled with warm lyricism and Slavic charm. Danilow and Lin were joined by violinist Arturo Delmoni, a festival staple and New York virtuoso who plays frequently in Vermont, in a stylish and sensually beautiful performance. The sound was rich and warm as Delmoni and the Russian-born Danilow, complemented by Lin, "sang" these rich melodies. Oddest was an obscure work by Ludwig van Beethoven, his one-movement Duo in E-flat Major for Viola and Cello, no masterpiece but full of typical Beethoven lyricism and interplay. Delmoni, this time on viola, and cellist Peter Sanders, the festival's founder and artistic director, had great fun with it and played it with aplomb. And it was beautiful. Dessert was "Navarra (Danza Espagnola)," Opus 33, by the Spanish Romantic violin virtuoso Pablo de Sarasate. Delmoni and Danilow, with Lin's help, enjoyed the work's sweet virtuosity, a delicious mix of sensual Spanish lyricism and violin pyrotechnics. The performers had great fun with it - as did the audience. Now 21 years old, the Central Vermont Chamber Music Festival has proved again to offer some of the most satisfying concerts among the state's many excellent summer classical music festivals. The three major works were likely unknown to virtually anyone in the audience at the Central Vermont Chamber Music Festival's opening concert Saturday at Chandler Music Hall, but there certainly were no complaints - for they ranged from the sublime to the spectacular. Spectacular, if not quite a masterpiece, was Camille Saint-Saëns overtly virtuosic Piano Quartet in B-flat Major, Opus 41. Full of late French Romantic excess, the work is passionately lyrical, extremely demanding of its players, and exciting as well as joyful. Saint-Saëns was one of the greatest pianists of his day, and this showed in the showy piano part. But pianist Thomas Schmidt delivered the powerful and often glittering solo part with aplomb and tonal beauty. Violinist Arturo Delmoni performed the other truly showy part with the flair of a virtuoso as well as his trademark lyrical expressive beauty. Violist Katherine Anderson and cellist Peter Sanders, the festival's founder and artistic director, weren't let off the hook either. Although less heard, they delivered their parts with expertise and passion. Although it took a moment to get going, it was a truly exciting performance. The Central Vermont Chamber Music Festival, now in its 20th year, brings New York instrumentalists, many of them members of the New York City Ballet orchestra, to Randolph for a couple of weeks each year to indulge in chamber music. (Sanders has been summering in Randolph at his family's seasonal home since childhood.) Like most festivals, the performances could afford a bit more rehearsal; conversely this festival's will match virtually any in the state. At the other end of the spectrum from the Saint-Saëns was Jean Françaix's sublime String Trio in C Major. A comparatively quiet piece, the work is filled with subtle rhythms and colors as well as muted early 20th century French knotty harmonic language. That muted effect didn't mean that the work lacked spirit. Delmoni, Aderson and Sanders played cohesively and with lyrical expressiveness, managing the complex rhythms to keep it light. The Andante, in particular, was beautifully tender, while the final Rondo: Vivo was jaunty and fun. In between the two emotionally was Benjamin Britten's Phantasy Quartet, Opus 2, for oboe and strings. The oboe has a long lyrical line, punctuated and flavored by strings, enjoying Britten's unique salty rhythms and harmonies. Oboist Randall Wolfgang, with the aforementioned strings, played with a warm expressive lyricism and musical depth. Still, the most tender moment was a sublimely beautiful performance of Robert Schumann's Romanze, Opus 28, No. 2, by cellist Sanders and pianist Schmidt. The solo piano work was arranged by Sanders' father, musicologist Ernest H. Sanders, and dedicated to the memory of Harry B. Watton, a major Randolph music supporter, who died last year. For its second weekend, the Central Vermont Chamber Music Festival will present the Lark Quartet, at 8 p.m. on Saturday, Aug. 28, at Chandler, in the world premiere of "Big Time" by Randolph native Nico Muhly, and Janacek's String Quartet No. 2 ("Intimate Letters"). The Lark will be joined by violist Cyrus Beroukhim and cellist Sanders in Brahms' String Sextet No. 2 in G Major. Despite being one of the best-kept secrets around, the Central Vermont Chamber Music Festival gets better and better. Closing its 19th season at Chandler Music Hall on Saturday, the veteran festival players offered up a richly rewarding performance of Schumann's E-flat Major Piano Quartet, Opus 47. Pianist Jeewon Park, violinist Adela Peña, violist David Cerutti and cellist Peter Sanders, the festival's artistic director, played with passion as well as restraint, delivering the work's excitement and its grandeur. The slow movement, Andante cantabile, in particular sang, with all three players giving it an overt expressiveness. The strings' singing lines were built upon Park's sensitive but powerful structure. And the finale was bold, lyrical and exciting. This festival is, for some of its players, summer respite from orchestra playing. All are veteran players and most over 30, giving their performances a depth that can come only with age and experience. The concert opened with a much more unusual work, Josef Suk's wonderfully melodramatic A Minor Piano Quartet, Opus 1. Suk (1874-1935), Dvorak's son-in-law, created richly Bohemian-flavored late Romantic music, some of it in the standard repertoire. This piano quartet is a youthful work, written when Suk was 17, but smacks of maturity and depth. Violinist Basia Danilow, now second violinist with the Lark Quartet, Cerutti, Sanders and Park delivered the work's passion. The slow movement, Adagio, in particular was intimately and hauntingly beautiful. The third work, the 1931 G Major String Trio, by early 20th-century British composer E.J. Moeran, was attractive but not deep. Peña, Cerutti and Sanders played well and with passion but could not make this rambling work a masterpiece. Still, the programming of unusual music is to be lauded as it adds perspective about where music and styles fit in. The Central Vermont Chamber Music Festival closed its 18th season Saturday at Chandler Music Hall, with a concert that wouldmatch in quality virtually any festival in the state - and, in Vermont, that's saying something. The major work and the biggest success on the program was Antonin Dvorak's String Quintet in G Major, Opus 77, a deeply lyrical work. Violinists Cyrus Beroukhim and Adela Peña, violist Danielle Farina, cellist Peter Sanders, the festival's founder and director, and bassist Roger Wagner delivered a mature and expressive performance that successfully plumbed the work's depths. Beroukhim, in particular, combined a warm and brilliant sound with a natural lyricism to make Dvorak's lines sing. But it was the ensemble as a whole that brought this rich tapestry cohesion and musical power. The slow movement, Poco andante, was intense, touching and sublime. Peña, Beroukhim and Farina opened the program with a virtuosic performance of Zoltan Kodály's earthy 1920 Serenade, Opus 12, full of salty Hungarian folk influences, both harmonically and rhythmically. The three played cohesively with flair as well as subtlety. Farina played with remarkable expressiveness. Real virtuosity as well as humor was heard in the Rossini's Duet in D Major for cello and bass. Sanders and Wagner had great fun with this operatic bonbon - as did the audience. It's been many years since I actually wanted to write a review. Decades spent in concert halls, museums, stadia and other places where music is presented have worn out my fingers and, unfortunately, dulled my senses. But Saturday's Central Vermont Chamber Festival concert at Chandler Music Hall had me babbling by intermission. When Peter Sanders told his listeners from the stage that they don't know how lucky they are, he was dead right. Except that I think they do know how lucky they are. He's lucky, too. Not only was the performance (of three good works, if not masterpieces) exceptional, but it had an exceptional audience. One could tell from the silence. And from the sense of smiles at particularly witty passages in Moritz Moszkowski's ebullient little Suite. From the complete stillnesses between movements---no rustling, no coughs, no shifting in seats or crackling of candy wrappers. Chandler itself is a gem of a hall, understated and beautifully balanced. It was obvious that people were listening very closely, and for good reason. Chamber music is a conversation, and Saturday's discussion was on the highest level. Of the three works on the program-the aforementioned Suite, Op. 71, for two violins and piano, Erno Dohnanyi's Serenade, Op. 10, for violin, viola and cello, and Felix Mendelssohn's Piano Quartet in c minor, Op. 1-the first was the most fully formed and the third the most promising. By the time of the Suite, Moszkowski was a composer in complete control of his medium. Listeners could easily follow the flow of thought, especially as advanced by violinists Arturo Delmoni and Adela Pena and pianist Jeewon Park. Dohnanyi may still have been finding his own voice at the time of the Serenade, but it was already rich and romantic. Violist David Cerutti and cellist Sanders joined Delmoni in a warm, sometimes gorgeous interpretation. Of the Mendelssohn Piano Quartet, written when he was 13, suffice it to say that there are flashes of beauty and moments when he's reaching beyond his grasp. Park's pianism sparkled, though Pena's sweet tone did not carry as well as it needed to. Quibble, quibble---stop being a critic, already. In the lobby afterward, a woman wearing an open cast from ankle to thigh on her left leg was overheard explaining how that happened: "I had just chased the coyote from the chickens, and the ground was uneven. And I was tired from using the chainsaw and climbing on and off the tractor." You're not likely to hear that in the lobby at Alice Tully Hall. "The Central Vermont Chamber Music Festival has become a welcome tradition in Randolph and the central Vermont area, and Saturday's impassioned high level illustrates just why." "Pianist Albert Stanziano, violinist Arturo Delmoni and cellist Peter Sanders simply reveled in this over-the-top music (Joachim Raff - Piano Trio in a minor, Op. 155). Stanziano delivered the dramatic washes of notes with clarity and virtuosity, while Delmoni and Sanders plied the dramatic lines with passion. They also responded to the subtle moments with sensitivity, making this a grand - and fun - performance." "Chamber music festival opens with finesse, spirit. Just when you think you've heard enough chamber music for the summer, someone comes along and performs the Mozart Clarinet Quintet - beautifully, in this case - and the passion returns immediately." "The Central Vermont Chamber Music Festival has proven itself over its 10 years, becoming an important part of Vermont’s musical fabric ... Saturday’s concert, which closed the season, was notable not only for its refinement of playing and ensemble, but its musical excitement." "Foote's 1890 Piano Quartet in C Major, Opus 23, rather than profound, is traditional, grand and lyrical. And in the hands of these fine players, it was a joy to hear. Violinist Arturo Delmoni, violist Leslie Tomkins, cellist Peter Sanders and pianist Christopher Oldfather delivered a well-played and grand performance." "The Central Vermont Chamber Music Festival has achieved a new level of excellence ... not only were the performances exciting, they were cohesive and satisfying." "Chandler Music Hall's Central Vermont Chamber Music Festival has come into its own with some powerful performances, these ... players can hold their own with the best in Vermont." The festival is a non-profit organization with 501(c)(3) tax-exempt status from the IRS. Click here to download a donation form and help support the CVCMF.